'I wanna be white!' Can we change race? Few academics expect to find their work hotly debated in the New York Times. Those who publish in feminist philosophy journals can reasonably expect a certain degree of obscurity. How then did philosophy professor Rebecca Tuvel's article, "In Defense of Transracialism," become the target of an angry petition, vociferous debate and international media commentary? 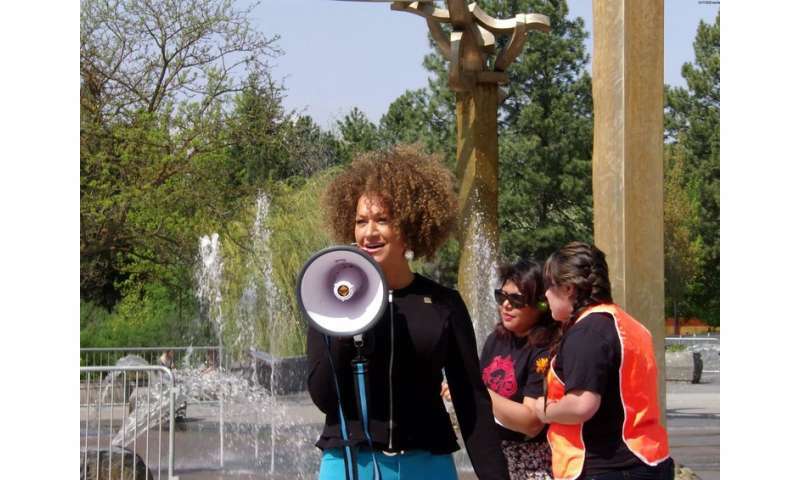 The outcry is not surprising, given that Tuvel's article begins with the highly publicized case of Rachel Dolezal, the former head of a local NAACP who was born to white parents but has lived for many years as a black woman. Dolezal's outright deception angered many. But Tuvel is right to ask: What does the case of Rachel Dolezal teach us about how we think about race? Tuvel argues that if we can celebrate the practice of gender transition, we should also accept racial transition. She wonders if society might "shift away from an emphasis on ancestral ties or skin colour of origin toward an emphasis on racial self-identification." Simply put, Tuvel says that we should accept someone's genuine desire to identify differently than their assigned race or gender. It's not that anyone talking about the Dolezal case condones her deception. But as Jelani Cobb wrote in the New Yorker, while Rachel Dolezal was lying, "she was lying about a lie." Drawing on the story of his own ancestors, which included light-skinned African Americans who looked not unlike Dolezal, Cobb explains it was her knowledge of that history that allowed Dolezal to violate the trust of her community. Nevertheless, as Cobb argues, it is the historical policing of racial categories that represents an even greater harm. Rebecca Tuvel, originally from Toronto and currently teaching philosophy of race and gender at Rhodes College, has a history of challenging injustice through philosophical and abstract thought. But in the "open letter" her critics say that she fails to engage with scholars of colour. Elsewhere, philosophy professor Nora Berenstain charges that Tuvel harms the transgendered community by objectifying transgendered bodies. It is clear that Tuvel's dispassionate stance, common to philosophers, may be interpreted as a kind of glibness. She glides over the political context of transgender communities and skips over the violent facts of racism that make racial boundaries inflexible in the lives of so many people of colour. By comparing racial and gender transition in abstract ways, we are in danger of forgetting that much racial transition has had its origin in the brutal facts of slavery. However, neither her critics nor her supporters have engaged with Tuvel's argument on transracialism. Tuvel's detractors outright condemn her work and demand that it be stripped from the academic record; her supporters focus on rhetorical claims about academic freedom, "callout culture" or "witch hunts." But no one is actually talking about race. And not dealing with race is precisely the problem we've had for decades. My own research into community organizations shows that hyper-emotional resistance to discussing racism inevitably sidetracks work on "diversity." Instead of having productive conversations, people get angry, defensive, or focus on their own guilt, rather than on organizational practices. So shutting down any attempts, however inelegant, to grapple with the politics of race today only perpetuates that silence. Tuvel deliberately takes race outside of its deeply historical categories in order to unravel its meanings. It has been well established by genetic analysis that there is no real or biological basis to what we used to think of as "races." And yet the political, social, economic, psychic and physical impact of racial categories has been and continues to be brutal. This is the central conundrum. We must recognize the everyday oppression that is based on rigid categories of race and gender—but at the same time, we must absolutely assert that those categories do not define us. Not surprisingly, Rachel Dolezal's story has become a carnivalesque side-show. Let's not also make a circus of Rebecca Tuvel's work. In treating both of these cases as spectacle, we only cultivate the notion that we would be better off not straying outside racial and theoretical lines, and that to stray is worthy of ridicule and censure. On the contrary, wide-ranging and radical thought and practice is precisely what we need to not only take us outside deeply entrenched categories of race and gender, but also to explode them. If we want to imagine race differently, if we want to challenge both racial hierarchies and categories, we will need radical creativity and imagination. We might take inspiration from the most creative efforts of popular culture today. Some comedic writers, for example, have taken on our absurd notions about race, gender and sexuality. An episode of The Mindy Project entitled "If I Were a White Man," aired this spring. After being passed over for a job as the head of obstetrics in favour of a less qualified white male colleague, Mindy wishes she were one. In this magic realist farce, Mindy wakes up the next morning in the body of a white man (played by Ryan Hansen), who effortlessly earns the respect of his colleagues and is offered the job as head of obstetrics. "But, don't I need to tell you why I would be an effective leader?" he asks the hiring committee. They chuckle jovially, "We don't need to ask you. We can tell you're a good leader just by looking at you." Similarly, the comedic team of Key and Peele have made their mark by using transracial theatre to challenge racism. In one tragicomic sketch, Key takes on the guise of a white police officer in a biting satire of recent police shootings. The point of these comedic interventions is not to change one's race, but to change how we think about racism and sexism. More cultural and intellectual creativity like this might help us to genuinely change how we think about race itself. One might be tempted to imagine that the production of knowledge happens in isolated ivory towers with little impact on the average person. Explosive academic debates remind us not only that ideas have real and harmful impacts, but also that ideas are, thankfully, continually challenged, fought over and evolving. We should be brave enough to keep asking difficult questions about race, gender and injustice; we must also be strong enough to weather the pain of getting it wrong. Retracting "In Defense of Transracialism" only narrows the opportunities we have to extend our ways of thinking about gender and race. Let's instead have conversations about how we might both recognize the daily violence of racism and also craft a different future—one that loosens the suffocating strictures of race and gender. Let's have those conversations with strength, creativity and even some subversive humour. Is changing one's race a sign of mental health problems? While I do find the concept of "changing one's race" repugnant, I cannot help that most of the time when people talk about problems with racism, the ever present idea that the White Man is the enemy, just keeps popping up. Also if you are white, it is almost a crime to be proud of it. I was taught to ignore race while growing up in the 80's, and that's what I will continue to do. Transracialism will happen and happen soon. With the advent of genetic engineering using crispr/cas9 it is inevitable that we will be able to change our race or probably chose to become a hybrid taking the best from all races.